JGarden Description: Located 1/10 mile from the Village of Saratoga the Hakone Gardens are said to be the oldest Japanese-style residential gardens in North America. They lie on a superb eighteen acre site nestled in the verdant hills of Saratoga. 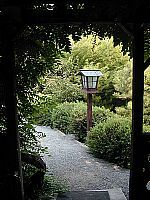 The Hakone gardens were originally developed by Oliver and Isabel Stine, who purchased the site in 1915 in order to build a summer retreat. The 1915 Pan-Pacific Exhibition inspired Isabel Stine to travel to Japan for ideas. The garden was named after the Fuji-Hakone National Park, one of her favorite places. The Stines retained Tsunematsu Shintani of Wakayama (1877-1921) to design the Moon Viewing House and Naoharu Aihara (1870-1941) to do the gardens. Aihara was descended from a line of Imperial gardens based Koyobashi, Tokyo. The garden is sits on a hillside with a view of Silicon Valley (then knonas the "Valley of Heart's Delight"). The overall design approach called for an Upper House and Lower House with a hill and pond garden weaving them together. The work was done in the sanso or country villa style popular in the late Edo period. The Upper House, with its dramatic views, was aligned for moon viewing and was finished in 1917. It is designed as a rustic, shoin style teahouse with a study and tokonoma. The Lower House was completed in 1922. It is somewhat more elaborate with redwood frame and wood siding. All of the garden and achitectural elements were constructed to the highest standards. The Ms. Stine brought the finest craftsmen from Japan and this remains an outstanding example of Meiji era garden art. The property was sold to Major C.L. Tilden, an East Bay financier, in 1932. His only contribution was the addition of a large main gate to the gardens. Through the war and subsequent years, the garden was not maintained at the same level and by 1966 had fallen into a state of neglect. The City of Saratoga rescued it from subdivision and hired Tanso Ishihara, a Kyoto garden builder, to restore the garden. He added some new elements, such as the Camelia garden and trails. He repaired the pond, waterfalls and pathway, and heavily pruned the garden. In collaboration with Kiyoshi Yasui, the architect fo the Imperial Household Agency responsible for the restoration of Katsura, he created a master plan for expanding the gardens to fill the entire 18-acre site. Ishihara died in an accident in 1980, ending his opportunity to implement the master plan. Friends in Japan and the United States, however, formed a team to see the plan fulfilled. Yasui, in particular, was instrumental in the formation of the Japan Bamboo Society and a Sister City relationship between Saratoga and Muko, Yasui's home town. Since then, the Bamboo Park [Kizuna-En] (1987), the Cultural Exchange Center (1990) and the tea plantation (1995) have been completed. In 1991 a reproduction of a 19th century Kyoto tea merchant's home and shop was added to the site. This structure was built in Japan using traditional methods and tools (no nails), disassembled and reconstructed on site by visiting artisans from Japan. This building contains a tea museum, a traditional tea service area, and is used for cultural and artistic events, weddings, and business meetings. A student that had studied with Ishihara in Kyoto, Jack Tomlinson, was appointed Japanese Garden Specialist and has overseen the maintenance of the garden in the years since.